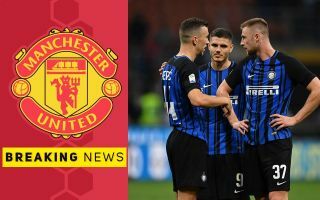 Inter Milan winger Ivan Perisic has admitted he was tempted by a transfer to Manchester United when the offer came along in the summer. The Croatia international has spoken out about an approach from former United boss Jose Mourinho, but explained his decision to turn it down and remain at the San Siro. ‘It’s true that an offer from Manchester United was on the table – I was really close to leaving Inter,’ Perisic told FourFourTwo. ‘But I decided to stay and, as I said, Spalletti’s perseverance to keep me played a big role. ‘In football, small details in these situations are key. ‘Admiration from a coach like Mourinho is definitely something that flattered me. Mourinho has since left United and it remains to be seen if the club would be back in for Perisic. Clearly a talented player, the 29-year-old would probably be too expensive for the club given his age.